Don’t forget to stop by and enter the Patterns by Figgy’s pattern giveaway! It’s open until Friday! Well, Natalie did get her very own tee for two shirt. I used the shirt pattern and the flutter sleeves. She picked out this nice interlock knit by Patty Young that I had ordered from fabric.com. They have a great selection of her knits here. The sizing on the pattern is really great, I think it’s right on the money. I can’t hardly wait to whip up a few boy ones for my nephew! And the best part is that this second round with the pattern went even quicker! I think this shirt maybe took an hour to make. Now onto a few little things on knits. I don’t know why there’s a lack of knit fabric sources online. I’ve been asking around with not much luck actually. I think fabric.com has about the largest selection of jersey knits (the one I used on emily’s dress), but you do need to make sure you take a good look at fiber content and I have ordered a few weird ones. Luckily fabric.com takes returns, I like that. I have ordered from Sewzanne’s (lots of quality knits) before, but it doesn’t seem like they have a lot of turnover in selection for whatever reason. I asked Toni from Make It Perfect and she suggested Crafty Mama’s out of Australia, they also ship internationally – looks like I need to do some shopping there! Hobby Lobby (pretty poor quality – at least at my local store) is also a good place to check if you have one nearby. The other thing that Shelly (Patterns by Figgy’s) mentioned was to check your local shops for knits. So I did. I don’t have a joanns very close by (but I assume they also have a fairly descent selection). But I do have a Hancock Fabrics. I sifted through the WHOLE store and rounded up more than I expected! I found a section up front with some nice t-shirt knit and some ribbing, then I walked back to the clearance section and found a great selection of knits for 2.95 a yard! I make sure to look for knits made mostly with cotton. If you can find any with a small % of spandex, it makes really nice waistband, etc. Jersey knit, bamboo knit, t-shirt knit are all good words to look for when searching online for knits. Oh, and I should mention that shopping the clearance sections of places like old navy and target are options as well. Of course you’ll want to pick out the largest sizes to get the most yardage from a tee or dress. use polyester (or polyester blend) thread, using all cotton isn’t a great idea since it won’t stretch as much as poly. I did sew Emily’s dress with cotton thread, only because I didn’t have another thread on hand that coordinated. That’s all I’ve got for now, hope that helps! And feel free to leave any tips of your own for sewing with knits in the comments, believe me, I’m no expert, but I’m always glad to learn something new. Such a lovely big smile, especially after her sulky face the other day when she didn’t have a tshirt yet. x. You missed my very favorite online source, The Fabric Fairy. Great selection, great service. Girl Charlee has some fun knits too. It’s adorable, I love the color combo. Tee for Two has been on my to-sew list for awhile. Thanks for the inspiration!! Thanks for the tips. My one attempt so far at a knit fabric (bamboo) was a complete nightmare, but I’d love to have another go. Wow, your Hancock’s has some pretty knits! So glad Natalie got her own. I loved the picture you had of her in the last post. Made me laugh as similar sad faces have occurred at our house over things like that. LOVE that picture of Natalie! She is looking so grown up! I was looking for boy knits – which are so hard to find and they have some nice choices. The shipping was a bit pricey since they came from Hong Kong and the width is only 32″ on most, but they are beautiful. Haven’t sewn with them yet – hopefully this weekend. I’m curious to know how well they hold up. It’s hard to find good-quality knits for sure, someone told me that a good source are the tshirt fabric sheet sets as they’re thick and made to withstand abrasion. I’ve had issues with the cheaper knits being fine for a wear or two and then losing their shape. The Oliver + S knits are meant to be really nice, though I haven’t felt them myself. And finally, the European knits (Crafty Mamas have heaps which you already know about) are good quality, you could also try Bunte Fabrics (http://buntefabrics.com/catalog.php?category=16) and Banberry Place (http://www.banberryplace.com/index.php?main_page=index&cPath=13_81_83). I get most of my knits from a fabric shop here in Auckland that specialises in selling bolt-ends of clothing designer and posh fabrics. Old (or new) knit camisoles (aka cami’s) can be cut into waist bands for things like circle skirts. Just be sure there’s a fair amount of lycra/spandex in them. I didnt know that about the poly thread. Thank you for the heads up! Thanks for the links. I need to find some good knits. I have a great Burda leggings pattern. My girls love leggings. fabric.com is one of my favorites(along with the fabric fairy and banberry place). i’ve also ordered some nice knits from chez ami. 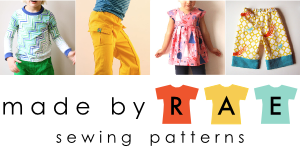 it’s an online children’s clothing boutique, but has a nice sellection of fabric by the yard. Cute shirt! I bought the Tee for Two pattern a while ago but haven’t tried it out yet. Thrift-store t-shirts are a perfect source for knit fabrics. I’ve made a bunch of LBB hoodies with matching pants using thrifted shirts. Just watch out for the armpit area–there may be odors lurking there that only come out when the shirt is ironed (yuck!). Cute!!! You have an awesome blog, I’m so glad I stumbled upon it. Glad to be a follower!! So glad miss grumpy pants is gone. Love her shirt and the flutter sleeves! The only knit-like fabric I’ve sewn is Minky. I love the way my blanket turned out, but it did stretch some while I was sewing. Will definitely pick up the ball point needle that you recommend. Thanks for the tips, Anna. Natalie’s shirt is adorable. Love the sleeves and love the stripes. Great colors for her. Great post! 🙂 Thanks for the mention.